Switzerland has one of the world's highest debt ratios for private households, and the figure is continuously increasing. Find out why high mortgage debt is problematic for a country, and where the trend is likely to go in the next few years. The level of debt in Switzerland is a concern. Switzerland regularly tops the rankings when it comes to the debt of private households – along with Sweden, Norway, Canada, and Australia. That is nothing to be proud of, because it shows that virtually no other country has a higher level of gross household debt relative to gross domestic product (GDP). Closer inspection shows that in all five countries mortgage debt accounts for 75%–97% of the total. This high level of indebtedness is a cause for concern, since it makes an economy vulnerable to market distortions such as stress in the banking system or a severe collapse in consumption. International analyses show that long phases of unusually generous bank lending are often followed by major crises. Switzerland had its own experience with a real estate and banking crisis in the 1990s. The Credit Suisse Real Estate Monitor keeps you informed about the latest trends in the real estate market. As well as examining the development of mortgage interest rates and volumes, the latest issue focuses on digital technologies as well as on real estate as an investment. Find out how digital technologies are transforming the structure of the mortgage market, and why the trend toward the construction of three-room apartments is not necessarily the key to success. Credit is a double-edged sword: It stimulates the economy, but beyond a certain level of indebtedness this advantage starts to turn into a disadvantage. At 146% of GDP, mortgage debt in Switzerland is already well beyond that threshold. The steep growth in mortgage debt is partly down to Swiss factors: high prices for real estate, a tax system that provides incentives for indebtedness, and the great significance of the rental apartment market – half of which is owned by private individuals. Fredy Hasenmaile, Head of Real Estate Analysis at Credit Suisse, discusses the impact of regulatory measures and the current growth in the debt ratio. Politicians have identified the problem. When the owner-occupied housing market threatened to overheat between 2010 and 2012, they tightened regulation on the lending banks. The banks in turn toughened up their own lending criteria, with the result that future homeowners now require more equity and have to pay off the loan more quickly. 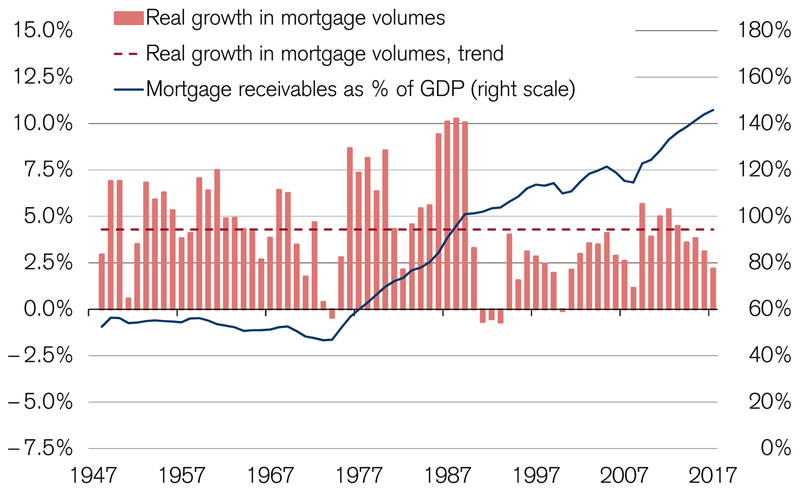 Since then, growth in the annual mortgage volume has halved from more than 5% at the beginning of 2012 to 2.57% by the end of 2017 – a far cry from the long-term average of 5.36%. Historical performance and financial market scenarios are not reliable indicators of future performance. The volume of mortgages in Switzerland is still likely to exceed CHF 1 trillion by the end of 2018. As well as the mortgage debt of private individuals, the figure also includes that of companies, although the latter make up just a quarter of all outstanding mortgages. It is not only the volume that is a source of concern. The fact that mortgage debt in Switzerland has continued to grow as a percentage of GDP is also worrying. This has been the case ever since 1975. Since then, the debt ratio has increased from 47% to 146%. The trend growth provides a glimmer of light, on the other hand. 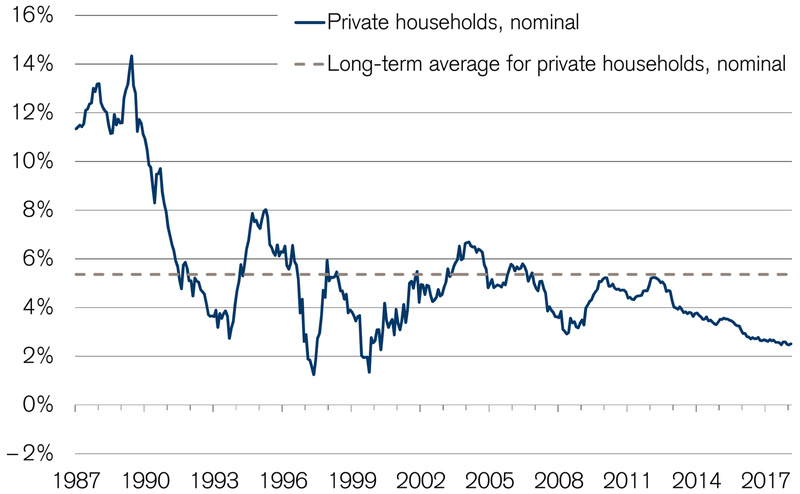 The growth in mortgage debt is well below the long-term average in both nominal and real terms. Whether or not the high debt ratio is becoming a problem is uncertain. Unlike other countries with high household debt, Swiss borrowers tend to go for fixed-rate mortgages, which makes them less exposed to interest-rate risk. In addition, the debt needs to be seen in the context of GDP growth. Weak economic growth has caused the debt ratio to rise more sharply in recent years. Last year, however, the trend was halted. A buoyant economy, combined with rising interest rates, is likely to go on slowing the rise in the debt ratio. Want to know more about how to protect yourself against rising interest rates? We would be happy to help. Call us at 0844 100 114.